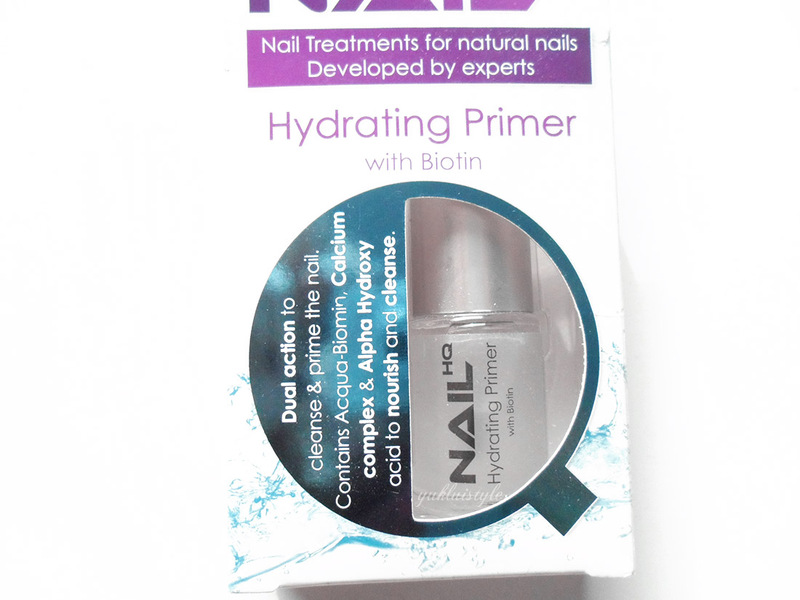 This primer contains Pentavitin, a “Moisture Magnet” with a unique Biotin & calcium complex to properly cleanse and prepare the nails before the application of polish or artificial nails. It will also help strengthen cuticles. The package instructs you to apply one coat, let it evaporate fully then apply another coat. When I have opened it, there is that typical strong nail polish scent which didn’t phase me. Once it has evaporated, it will leave a ghostly white effect on your nails but this will disappear when you apply a base coat/nail colour. It evaporated very quickly. I wasn’t exactly sure whether my nail was meant to feel smooth or not like how face primers works. The texture was the same as before the primer was applied but it did help the nail polish/base coat to go on a lot smoother. Do not apply this over broken skin, it will sting. I wouldn’t say this is a base coat product but you can use it like one. It didn’t help make the polish last longer. In terms of whether it helped nourish my nail, it’s hard to tell at the moment as I’m not constantly using it especially if I have polish on. My nails are prone to breakage nowadays so I am in need of some TLC for them. 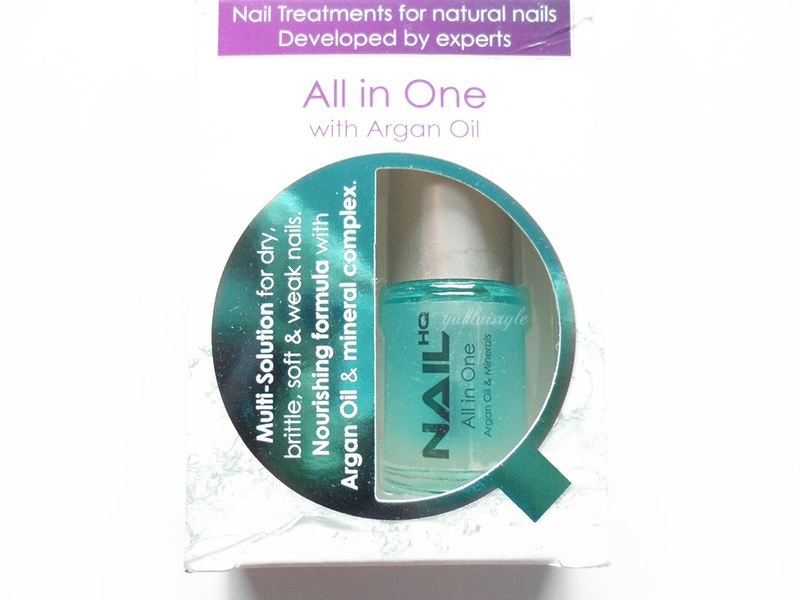 This all in one contains argan oil and mineral complex for the dry, brittle, soft and weak nails. It helps provide moisture and to also help prevent brittleness and breakage and make them flexible. Moisturise, condition and strengthen. When I grow my nails and have decent length, they will break and bend and it can be painful at times. I’m always on the look out to strengthen my nails and this sounds like it has the answer. This has actually helped my nails from breaking over time. It definitely feels stronger but it does require time to see the results as it’s unfortunately not an instant result. This can be used as a base coat or on it’s own. When used on it’s own, it gives off a semi matte finish. It may look blue in the bottle but it’s actually clear. Just like the primer, it does have the typical polish scent. I have used this as a base coat and didn’t find it helped my nail polish last longer than usual nor did the polish go on smoothly as I had hoped. On one nail, it started to chip the next day and the rest started to chip as the days went by. I would rather use this on it’s own. The full Nail HQ range can be found in Superdrug, Amazon and in Tesco. 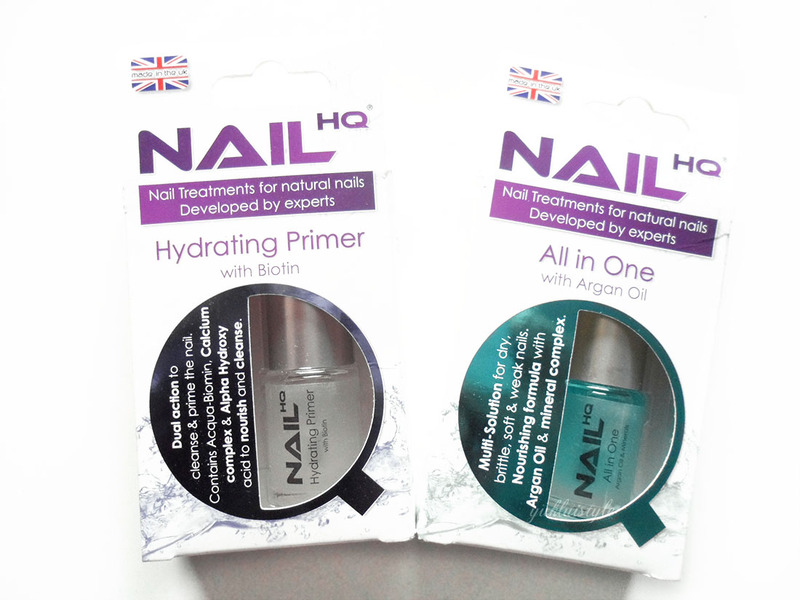 Have you tried any Nail HQ products? I have been using this for two weeks now and my nails are getting so much stronger. Ii have been using the hydratng primer. Great post will try the oil too next! I so need this right now. My nails keep clipping off all the time. I never heard nor try this brand before.. But sounds like it's a great product..
both products look amazing, judging from your writing. Never heard of this brand before! what a great product to try. I'm not a makeup person but whenever I read something related to it always makes me wanna try. I haven't tried using a primer myself. But will definitely look for this one whenever I get the guts. hmm doesn't seem like it helps a lot though :/ maybe sally hansen will do the trick! I can't say that I did. I normally use Sally Hansen for all my nails needs. I've never heard of Nail HQ before. I use Models Own, Sally Hansen & Barry M a lot. I like the look of the All in One with Argan Oil one. I'll look them up on Amazon now. Nail prime sounds pretty new to me! I assume it works as a base coat. really interesting product. Oh I would love top try this out as I am a nail polish junkie.getting salon nails at home is with this is so great.